Cameroon and its neighbors welcome the U.S. decision this week to send troops to the country to help track Boko Haram militants in the region. The announcement comes amid an increasing number of suicide attacks on civilians in border areas of Nigeria, Cameroon, Chad and Niger. Boko Haram has killed about 400 civilians in northern Cameroon since last year. The group's brazen attacks in recent months have led the government to beef up its military presence in the region with backing from Chad. For example, public buildings throughout the capital, Yaounde, have been fitted with metal detectors. Eric Kuisseu, a construction engineer, said, "It's a good initiative. It makes Cameroonians aware of what our country is going through." But many people have had enough of the violence and are trying to leave the country in the hope of a better life in western Europe. Some don't make it, including one woman from Yaounde who has been detained by the coast guard in Libya. The female migrant said, "Why I left my country? Because of Boko Haram. Boko Haram is still disturbing us. They kill our parents. They kill our brothers and sisters. That is why I have to run from my country: to find and give good education for my children and my husband." The Obama administration announced Wednesday it will deploy up to 300 military personnel to Cameroon for intelligence, surveillance and reconnaissance operations against Boko Haram insurgents. While some Cameroonians welcome the support, others question the motives behind the help. Edmond Kamguia, a teacher at the Catholic University of Douala, said, "The decision to send American troops is very timely, because it is support that will really help Cameroon. And beyond this support, we have to look at the entire front line -- it's not just Cameroon receiving support." Yes, Eric Tchiage, a company director, said, "I can understand that such a crisis situation needs energy and responses that are adapted to the situation, but we must not forget that the states that come to help us have an interest in it." 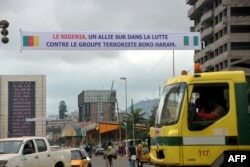 Neighboring Nigeria also has welcomed the U.S. decision to send troops to Cameroon and has asked other countries to follow suit in order to eradicate terrorism in the region.